John Fisher was swept overboard Monday afternoon. Sun Hung Kai/Scallywag during leg seven of the Volvo Ocean Race. DETERIORATING WEATHER FORCED a Volvo Ocean Race yacht to abandon its search for a British crew member washed overboard in the hostile Southern Ocean yesterday, with organisers admitting the man is now “presumed to have been lost at sea”. John Fisher went missing from the SHK/Scallywag on Monday some 2,250 kilometres (1,400 miles) west of Cape Horn on the tip of South America. Fisher was on watch and wearing survival gear when he went overboard amid gale force winds and water temperatures estimated at nine degrees celsius. Scallywag searched the sea for almost 12 hours but failed to find him and was forced to head for land as nightfall descended and conditions worsened. “This morning I am extremely sad to inform you that one of our sailors, John Fisher, from Team Sun Hung Kai/Scallywag, is now presumed to have been lost at sea,” Richard Brisius, the President of the Volvo Ocean Race said in a statement. Organisers also said a ship that was within 400 miles of the accident site was diverted to look for Fisher and Chilean maritime rescue authorities were attempting to contact other vessels for help. The six other vessels in the Volvo fleet – including Irish Olympian Annalise Murphy’s team, Turn The Tide On Plastic — were unable to assist because they were 200 miles downwind and battling severe weather when Fisher went overboard. The rest of Scallywag’s crew were reported to be safe. Fisher is an Australian-based Briton who belonged to Christies Sailing Club in Adelaide, which opened its doors Tuesday for his friends to comfort each other. “Our thoughts and prayers go out to Kirsten, Ryan and Amy. No words can express our sympathy and pain,” the club said in a Facebook post. 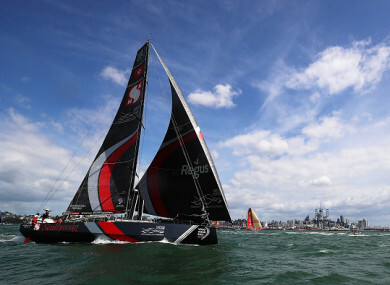 The Race fleet set off from Auckland on 18 March on the toughest stretch of the around-the-world epic. The 14,075 kilometre leg of the race takes the yachts on a three-week voyage across inhospitable waters from New Zealand to Cape Horn and then up South America’s eastern coast to the Brazilian city of Itajai. The 2017-18 Volvo Ocean Race is the longest in the competition’s 44-year history, stretching over eight months and 45,000 nautical miles around the globe and ending in The Hague in the Netherlands in late June. The race has already been marred by tragedy, when Vestas 11th Hour Racing collided with a trawler on its way to Hong Kong, killing a fisherman. Email “British sailor 'presumed lost at sea' after going overboard in the Volvo Ocean Race”. Feedback on “British sailor 'presumed lost at sea' after going overboard in the Volvo Ocean Race”.